Welcome the The Shift Blog, a space where we amplify the innovative work that is happening in education. Sarah Cronin is a teacher for the Halton District School Board and the program leader for Special Education at Milton District High School. She has written previously for us, sharing her work leading other teachers through their own passion projects. You can learn more about her journey on her blog. After reading about teacher passion projects in the book Hacking Leadership, I wanted to support professional development in this meaningful and purposeful way with members of my team. Teacher passion projects are when teachers take control of their own professional learning through choosing an area of education on which to focus. Topics are varied and learning is centred around working toward becoming a better teacher overall. Learn about it here! Positive impacts of exercise and diet on emotional wellbeing with a student who struggles with mental wellness. Website development designed for teachers full of helpful and thoughtful resources. Finally my own project, enhancing my leadership skills through supporting teachers in their learning - a.k.a. - capacity building. Some projects took right off and others continue to be a work in progress. What is important to me as a leader is not the final product, but of course, the process of learning itself. The professional conversations happening along the way are invaluable. In addition to conversations between myself and participating team members, they were also asked to reflect on their learning more formally at midterm and at the end of the semester. Providing the opportunity for my colleagues to learn in this capacity allowed teachers to fuel their understanding of working with exceptional students. They were able to engage with students in meaningful ways ultimately creating positive impacts. The fact that teachers owned their own professional development allowed them to make connections with each other and with students in new ways that were meaningful to them and their practice. As a program lead for Special Education at Milton District High School, one of my goals for my department is to help embed special education knowledge throughout the school and support strategies within regular classrooms. The team is diversified in their subject areas ranging from English, ELL, Science, Student Success, The Arts - to name a few - and because of the learning communities happening from within the Passion Project, this goal began a successful journey. The Blogging Project - Educator and SERT Christina Paquette was so excited to use her passion project as a way to really create a community of learning within her ELL classroom through student blogging: Here is an example of a student written blog that was a response to being new to Canada and seeing snow for the first time: Walk on Snow for the first time. I set out with the intention to as a leader, support meaningful and purposeful professional development within my department as a means to enhance teacher capacity within the school. It was invigorating for me to work with my colleagues in a way that was supporting all of our learning. As much as they learned, I too learned, growing my leadership skill set. I feel this project was successful and I would absolutely run this initiative again. The capacity to build professional learning communities within the department is a wonderful way to bring cohesion to a team that works across several different departments. It is hard to connect with each other daily, and this provided an opportunity to check in weekly ‘geek out’ in our learning. The Passion Project opportunity also allows professional conversations to filter through to several different departments, as teachers return to other departments , new ideas and strategies reach into their team practices, spreading the knowledge of supportive and engaging strategies for kids who learn differently throughout the school. I really like the structure I used to implement the project, and I am happy with the process. I may consider personalizing the reflection questions to more specifically address Special Education as it relates to my own school. I also know that as the school year progresses so does the pace and intensity of the job. People become busier and time is of the essence, as is energy. I recommend running an initiative like this once in a year. Pick a semester and end date the project before the turnover. Why? It puts some parameters on finishing. Although we know learning never really ends and continues on, people also need to feel a sense of accomplishment and closure in their initiatives. This allows them to plan their next steps in where they want to take their learning moving forward. If you are interested in trying out a Teacher Passion Project, feel free to connect with Sarah any time. She’d be happy to help! Last year, the Shift was fortunate to experience the Deeper Learning Conference in San Diego. Ever since, we’ve been hard at work with various educators around the Halton District School Board to push our learning even further. Today, after a year of hard work, “try, fail, learn” and so many emotional ups and downs we are pleased to launch the next phase of The Shift. Are you ready for Even Deeper Learning? We had thought, with the expertise of our partners in the School Programs Department, that we had taken our learning as deep as it could go. But of course, after months of trying, failing and learning, we realize that we haven’t taken our work deep enough. As it was discussed in Ted Dintersmith’s film, Most Likely to Succeed, in order for students to investigate a subject with depth, one does sacrifice some breadth. This was made clear to us when we started working with Rotman and their I-Think Program. 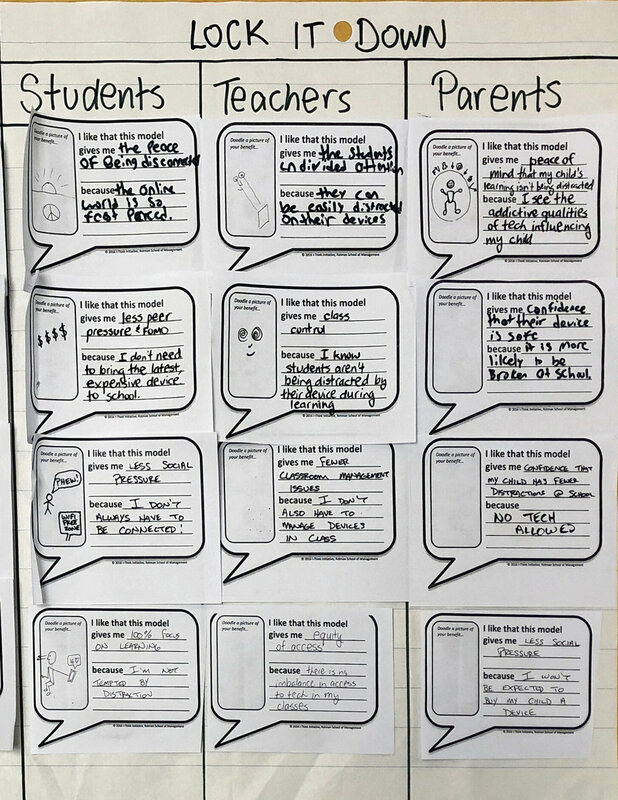 Last November, we were given the opportunity to expand on our understanding of Deeper Learning by using one of the I-Think tools. By using the Pro/Pro chart and the models of “Keeping Learning on the Surface” vs “Taking Learning Deeper” we were able to expand on our understanding of what Even Deeper Learning could be. First, we were able to understand that, like people who are Innovative, those who can go deeper with their own learning have a very specific set of tools at their disposal. The Deepest Learners need to be able to break apart their misconceptions and fixed mental models with a pickaxe of knowledge. They must shovel away their own distractions as they excavate a path to new ideas. Finally, they need to illuminate their new understandings in order to shine their light on the ultimate student success goal with their headlamps of intuition. With this new framework in mind, we realized that to drive student learning even deeper we needed to radically transform what our classrooms look like. If learning is to stay on the surface, so too should classrooms stay on the surface. But this isn’t how the deepest learning works. 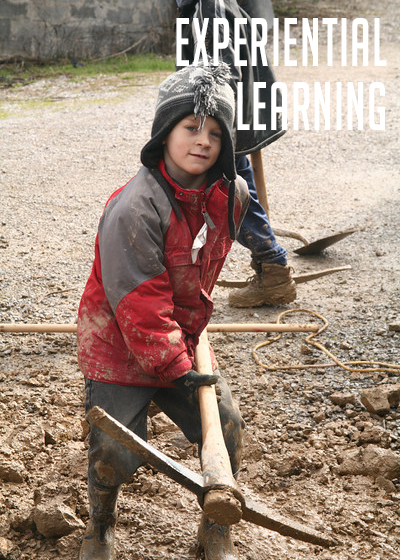 To experience Even Deeper Learning, we need to take the idea of the classroom and send it underground. We will be mining our students for their knowledge as they explore new depths of understanding. 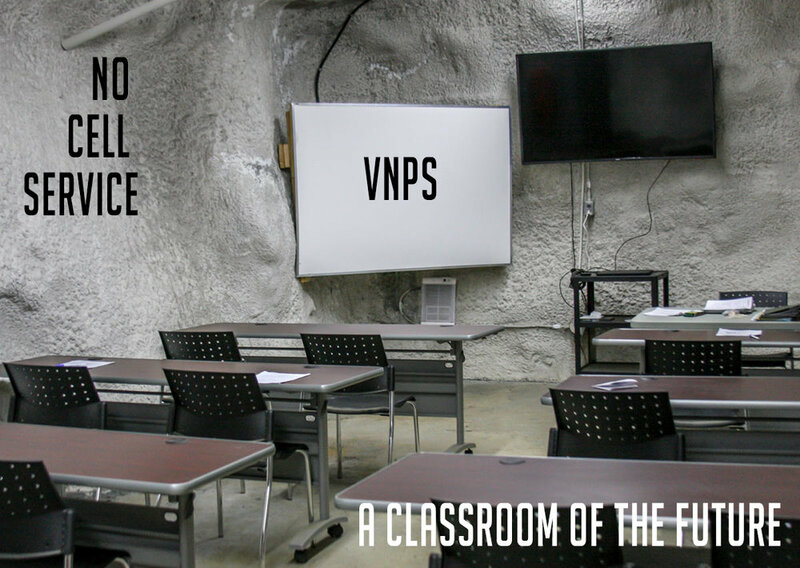 What a better way to do this than to physically teach our students underground. Sunlight, a cool breeze, animals...these are all distractions to the Deepest of Learners. Halton’s newest underground school will strip away all of these distractions, except for one single Canary that will also act as the school's new mascot. Opening in the Fall of 2021, Excavation Public School, a 7-12 underground education campus, will boast the newest in Even Deeper Learning innovations. Students will learn in some of the deepest classrooms of the world, using some of the deepest pedagogy of the 21st Century. Thinking Classrooms become Thinking Caverns. Design Thinking will make way to Design Digging. The I-Think Tools we’ve come to embrace will evolve into Pro/Spect charts, Tunnels of Inference and Causal Surveying. Failure is not an option at Excavation Public School because safety is our utmost concern and we aim to have a cave in free school year. Find your own way to Learn Deeper! The Shift has decided it is time to throw down the gauntlet and invite our fellow Shifters to try something new. We love getting out to see other school communities and other teachers’ classrooms in action, but there are only two of us and there is a lot of great work to see. We think now is a good time for some Shift challenges. Every so often we will post some #TryShifting challenges here. To start with, there are already three available for you to try, such as starting an educational Twitter account, or convincing a friend to do so. There are no deadlines or due dates. You can spend as long as you want working on a challenge. They can be completed individually or in a group. All we ask is that you share your work with the wider education community using the #TryShifting hashtag. Post some pictures, reflect on how the challenge went. What did you learn? So what are you waiting for? Try some Shifting! Want to Shift into I-Think? Have you been following along with our work with Rotman I-Think? Are you curious about how I-Think engages students to think in powerful ways? Do you have an intermediate or secondary science teacher friend who won’t stop talking about Pro/Pro Charts? Are you a Halton District School Board teacher who is interested to learn more? Why not join us for a celebration of the work completed in Semester One, while we also launch our new work in Semester Two! You can learn how you could be involved too! This is a free event, Register on Halton’s PD Place using the code 232844. Christine Vanderwal is a grade 7 teacher at Viola Desmond Public School. She is passionate about equity, Indigenous perspectives, building relationships, listening to students' stories, meeting the needs of her learners, and building safe school cultures. This is her first contribution to the Shift Blog. One day, my students were deep into their inquiry work. One boy wandered over to me. He told me that he was sorry to have gotten off track, but that he was looking into wood extraction and the search somehow took him to a page about his ancestral country of Pakistan. He wanted to show me some beautiful landscape images of the country. We chatted about it for a few minutes. Then he said, "That's my favourite part about this class." Unclear about what he meant, I replied, "What's your favourite part about this class?" "That I can talk so much about where my family originates, Pakistan." He answered. This coming from a kid who had learned how to code on scratch, created videos, engaged in drama activities, design challenges, built a game for Genius Hour, started a blog, and played with circuits. I would have guessed that one of those things might be his highlight about our classroom. I was wrong. His favourite part about our class was that we talked about our stories, we celebrated our identities, and took time to do that. I believe in empowering students. I want to learn about new technologies, new ways for students to express themselves. I want to take my learning about how to integrate arts education deeper. I want to inspire kids to tell stories in different ways, to dive into Project Based Learning, Thinking classroom, outdoor education, Integrative and Design Thinking, Knowledge Building, and make everything we do in our classroom authentic. The more I learn about innovative teaching practices though, the more I want to dive into the work of equity. I see the two as going hand in hand. Students will never feel empowered unless they feel heard, unless they feel valued, unless they feel welcomed into a safe space everyday. A space where they can truly be themselves, take creative risks, speak their opinions without judgement. If we as teachers are going to empower our learners, it is AS much about the culture that we create in our classrooms, as it is about innovative teaching practices. The work of equity, exploring Indigenous Perspectives, building relationships, listening to our students' stories, meeting the needs of our learners, and building safe school cultures needs to lay the foundation for innovation and student empowerment. My students taught me this. One day in my grade seven class last year something happened in the room. I went in that day thinking it was not going to be a good one. Rainy days, double indoor recesses can be rough in Elementary school! After the break, students were yawning, and itching to get outside. I wasn’t sure if it was a good move or not, but I pushed ahead and had them set up the space to continue on the inquiry we’d been working through, which was part of a larger Project Based Learning experience. I didn’t think it would go well. I couldn’t feel the energy in the room, and today, I didn’t have the energy either. It took quite awhile for students to start their investigations, I had to give some reminders to a few to make good choices, people were asking to take walking breaks early into the period, it didn’t feel great. Two boys ran up to me, computer in hand, wanting to show a video they were watching on the impact of seismic blasting on marine animals. They were excited that the video featured an Inuit perspective. It was like their energy, their passion was contagious, it began to spread around the room. A few minutes later someone else called me over to watch an animated video she had found showing the impact of extracting resources on animals. Before I knew it, half the class were up and gathered around her computer. We all shared a bit of an emotional moment, and it sparked ideas about how we might use art to make an impact on an audience. Off another student went to the idea board. I suggested that a group tweet out some of what they had found using the hashtag we had developed to try to make some connections online. They sat huddled around a chromebook in the hallway, composing a tweet. Someone else came up, asking if we could have a chart paper up somewhere so that he could put up new learning and thinking that wasn’t necessarily connected to any of our questions, but that shouldn’t be forgotten. It was so neat, because they were investigating two completely different questions, but were sharing theories and ideas, finding connections. This is the power of fostering a knowledge building community in the classroom. By the end of the period, every single student had something to add to our knowledge building board. Arrows were being drawn, connecting ideas. I stood back and watched, listened. Even if they weren’t all talking at that point about their inquiry, I was witnessing something special, a little bit of magic. They were connecting intellectually through the inquiry, by sharing ideas, critical thinking and questions. Perhaps more importantly though, they were connecting as individuals, relationships that we had built over the year were strengthening. I realized that all of the work we had done at the beginning of the year and throughout building relationships, getting to know our each other’s stories, talking about issues of injustice and equity in our world, exploring Indigenous perspectives in connection to the land, had laid the foundation for this deep inquiry work and knowledge building to happen, so organically. Teaching this way is not easy, it is so messy, so unpredictable. It does not work beautifully every day. Kids are resistant sometimes, they aren’t always engaged, not every one of them, not all the time. Sometimes I wonder if they are learning enough. Do I give them too much freedom? Do things need to be more structured or less structured? Am I giving everyone what they need? Are my expectations high enough? These questions are important for me to keep asking. We need to be reflective about our practice and what is happening in our classrooms. Even though it is messy, I believe in it. I’ve seen the impact that teaching and learning like this can have on kids. The power of Knowledge Building and PBL was so clear to me that day. Teaching this way empowers students, gives everyone a voice, deepens the learning and creates communities of creative and critical thinkers, global citizens who are starting to realize they can be a contributing part of our society now. It helps students develop confidence by discovering their strengths and realizing their passions. Isn’t that what school should be about? My students make me want to do better. My students inspire me to learn and to grow. Their voices are so powerful, when we take the time to listen, when we let them tell their story. This week, Halton opened the doors on its newest elementary school, named after a Canadian civil rights leader, Viola Desmond. Up until the Christmas Break, students who were to attend Viola Desmond Public School had been split between several other area schools while construction on their building was finished. This splitting of the new school community made building relationships between the new staff and students challenging. However, with the unveiling of the new Canadian Ten Dollar Bill, featuring a portrait of Viola Desmond, staff and students were given an opportunity to gather in November to celebrate. Bijan Nagji and Sarah Patterson, two teachers at Viola Desmond, spoke to their students about the importance of this event and how they felt having their school named after such a leader. Students feel a sense of pride by attending a school named after someone who stood up for their own rights and the rights of others. They recognize that she was different and that there are many visible and invisible differences among the students at Viola Desmond Public School. Students are excited to be learning in a community that embraces these differences, where students are comfortable talking openly about these difference and respecting everyone's diverse backgrounds. Students realize the legacy of Viola Desmond and are happy to represent her in their own community. What is a Pro-Pro Chart? If you have been following along on with Shift twitter, you may have witnessed educators getting excited about something called a pro-pro chart. You may also be wondering what on Earth the excitement is for this tool? A group of HDSB science teachers, led by the Instructional Program Leaders for Science in both elementary and secondary panels, teaching grades 7 to 10 from eight different schools are participating in a series of workshops to learn about Integrative Thinking, which is a creative way to problem solving. It was developed by Roger Martin at Rotman School of Management as tools for businesses to make important management decisions, it quickly became apparent that these tools were enormously useful in education as a way for students to think more deeply about problems in the world around them. Rotman I-THINK tools are accessible to students in elementary and secondary and be can used to build empathy through tackling some really tricky problems and are good entry points for design thinking and project based learning. So what are these tools? At their core, they are really well developed strategies that are structured to engage students in deep thinking, allowing them to examine the world around them. The first tool introduced by I-THINK to the Halton educators is the pro-pro chart and that is the focus of our what we’ll focus on because frankly, the tool is SO. DARN. COOL! (in a nerdy teacher pedagogical sort of way). Everyone has heard of a pro-con list for making a decision. The pro-pro chart reimagines that process to focus on the POSITIVE aspects of two opposing ideas. In order to highlight how this tool works in the class, let’s consider a current issue that is in the media and in current political discussion, the use of cell phones by students at school, by using a pro-pro chart. For many, talking about this issue could quickly turn into examining the pros and cons list of for or against this idea. Doing so will inevitably lead to complaints, negative ideas and a process that feels like an unsatisfying answer. As the video explains, using a pro con list to make a decision results in making a decision based on the side that has the least number of cons. Introduction to Integrative Thinking from The Learning Exchange (1) on Vimeo. Using a pro-pro chart, you are trying to “fall in love” with both sides of an issue. In fact, it’s not enough to fall in love with both side, you have to fall in love with the most extreme version of either side. Neither of these models are desirable so why push it to such extremes? It is that tension between two extremes, coupled by finding the benefits of those extremes that pushes thinking into new and creative directions. Let’s visually take you through the process of setting up the pro-pro chart. Students fill in these “benefit bubbles” to identify and explain what the pros or benefits are for each stakeholder. Benefit Bubbles put participants directly in the shoes of stakeholders (in this image students and parents respectively) thinking in the first person how this model benefits them. This is a great way to build empathy and understanding for others. Participants fall in love with one model, creating as many specific benefits as possible. Participants ask themselves, if this model worked perfectly, what are the benefits for each stakeholder? Participants fall in love with the opposite model, again with the benefits. In this case, what are the pros to locking the school down and allowing no cell phones at all ever? It is a good thinking exercise to think of benefits of a model you don’t personally agree with. Which benefits could you absolutely not live without? Being selective, students add hearts to the most important benefits. If you could capture the most important essence into of that model, what would it be? If you could create your dream school what would it look like, feel like, sound like? Let’s assemble and imagine together! Join us for #NotAStaffMeeting on November 29, 2018 from 4-6pm at Milton District High School. We are inviting all interested educators to come hang out, chat and dream. This will be an informal affair to reconnect, feed each others’ mojo with some total support, deep thinking, saying Yes, And… Go Big with our ideas. Let’s chat about the future of our schools and how we could make school different in Ontario. Does that sound like something you would be into? Join us! Fill out this quick Google Form so we will get an idea of numbers, and let’s PLAY! Being embedded as coaches in a school is providing The Shift with many unique opportunities to collaborate with other teachers. Two weeks ago, we were approached by two Milton District High School Science teachers who had heard about the Thinking Classroom and wanted to try it out with their Grade Nine Science students. This was exciting, because it was going to be a challenge for us as well as them. Our own areas of expertise currently lay outside of the science curriculum, we could bring the strategies of the Thinking Classroom to the table, but as far as knowing how to apply it to individual topics, we were at the mercy of the classroom teachers. But this is how we like to learn and grow, collaboratively. The topic in question was Bohr Rutherford diagrams and the periodic table. This is traditionally taught by the teacher leading a lesson on atomic theory, the parts of the atom, how to draw Bohr Rutherford diagrams and then, how these diagrams related to the periodic table. Traditionally, the periodic table was given to the students first, without creating a reason for them to need it. Hilary Rivett and Jennifer Pratt, the teachers working with The Shift, wanted to change that. They were hoping that by using the Thinking Classroom model students would better understand and appreciate the need for the periodic table. So with those two goals in mind, teaching students how to draw Bohr Rutherford diagrams and making them want to use the periodic table, we got to work. We spent some time discussing the research and philosophy behind the Thinking Classroom, why it is good for students and teachers and how it can be applied to the classroom. As luck would have it, we’ve recently released a Podcast on this very topic. You can listen to it here. The format we decided on was pretty exciting for the educators, and we knew it would be a challenge for the students. In a nutshell, the teacher would gather the class around one of the whiteboards in the Demonstration Classroom and start their lesson. The script was simple, “This is how I would draw Lithium. This is how I’d draw Boron. This is how I’d draw Argon”. Total lesson time, about four minutes. Some questions were asked, like “What makes up the nucleus of an Atom”, but other than that, students were sent to their groups with the challenge question, “Can you draw Beryllium?”. There was a frenzy of frustrated struggling. Students were not in Flow, they didn’t know how the teacher drew their diagrams, what the rings represented, what the numbers on the board meant, or how to even start drawing their element. However, as groups moved back and forth between their boards and the teachers work small hints of understanding began to emerge. And this was the moment the teachers were waiting for. The groups were quickly realizing that they needed a tool to help them draw their diagrams. That tool was the Periodic Table. “Is there something you’ve seen that might help you?”, asked the teacher. The words were barely out of their mouth before the groups were rushing to their backpacks to grab their Periodic Tables. Connections were quickly made between the atomic number of an element and the number of protons. With a bit more thinking, students realized that the number of protons and electrons were equal in these diagrams. More insight followed with respect to the placement of the electrons. Students were flying through our examples now and by the end of the 75 minute period had drawn several diagrams, listed the steps to draw any of the first 20 elements and were working on consolidating their drawings into an individual meaningful note. Hilary and Jennifer were pretty pumped with how well things went. Normally it takes them two days to get students this far along. Everyone was looking forward to day two, which was going to start with a challenge. The students didn’t disappoint us, but the point of this exercise wasn’t to see how quickly things could get drawn. The teachers wanted to consolidate a bit more of the learning from yesterday and have a big visual for the class to refer to. Students were again divided into groups of three and sent to individual white boards to work. Their question for the day, “What patterns do you notice in our big periodic table of Bohr Rutherford diagrams?” Some groups jumped right into finding patterns, others needed some nudging. “What if you looked across the rows? Or down the columns?” More thinking from students resulted in some pretty insightful observations around the trends and rules of the Periodic Table. There was a bit of a disaster at the beginning of the third day, as the class created Periodic Table had been mistakenly erased in the night. Perhaps it shouldn’t have been a surprise to us when multiple students in the class asked if they could redraw it before the bell rang! Afterwards, student groups were assigned two different elements and were asked to use an online source to learn all they could about each element, including how it behaves. Once groups had a decent handle on their elements, the teacher asked them to circulate around the room and find other elements that might belong to their “family”. Students were again able to reinforce the connections made the day before with respect to the trends and patterns in the Periodic Table. Which is a great point for these students to get to, mostly on their own, by the end of this activity. On day four they will be back in their regular science lab doing some experiments around reactivity of elements. It’ll be a great way to test some of the theories and patterns they determined previously. All told, there was about 20 minutes of formal teaching over the three days of this activity. The bulk of the work was done and lead by students, working collaboratively and thinking critically. The biggest challenge was getting them used to working within the Thinking Classroom model. One class in particular was very high energy and had several students that were prone to outbursts. The great piece from having students standing, working at whiteboard was that the energy from these students were directed at the problem being solved, rather than the class and teacher. All in all, a lot was learned by the teachers and us in this process. The Shift was able to mentor two teachers through a planning and execution of a lesson while at the same time teaching them about the Thinking Classroom. As a bonus, we learned a lot about the Periodic Table too! Do you have a Professional Learning Network? Is there a group of educators with whom you enjoy connecting with, who push your own thinking and expose you to new ideas? We like to connect with as many people as we can online. One of those people is Matthew Oldridge, an educator who is currently on secondment to the Ministry of Education. He tweets about mathematics, or education, or pop-culture, or his family. We enjoy his online presence because it isn’t one dimensional, he is great at letting people in and showcasing the fact that yes, he is a human when he isn’t teaching. Matthew recently posed a series of questions on his blog which he challenged his own PLN to think about and respond to. These are the types of questions that The Shift likes to think about and, by speaking about them, coach others into thinking about them too. The Shift sat down and talked through each question and have responded to the ones that we felt we had the most to contribute. If anything we says resonates with you, take the conversation online or respond in the comments below. What has been your most powerful pedagogical moment? It was probably attending the Deeper Learning Conference. The experience peeled away a lot of the movie magic that was applied in the documentary Most Likely to Succeed. Were students completing high quality projects? Yes. Were they also being taught curriculum in a setting we might recognize? Absolutely. The fact that students were doing both made this moment so powerful. We love teaching students about math and art. We don’t love that we have to take the subject we love to teach about, and more often than not measure that learning through a timed test or static project. We’ve often wanted our students to show us their learning in different ways but were never fully satisfied with the tasks we would give them. Attending Deeper Learning and visiting High Tech High convinced us that projects that integrate learning across subjects, that force students to dive deeper into their learning, and have students exhibit their learning in public ways were possible. It’s something we would love to help other teachers try. What changes do you want to see in curricula around the world? The greatest overall change we hope to see change in curricula is one that values depth over breadth. There can be a great deal of stress and anxiety that comes with trying to cover all the topics in a curriculum so packed with content that they have no time to go deep on anything. If curricula had less specific content to cover, what could that space allow? Going deep with curriculum would enable bringing student voice and student identity. Simply put, not cramming in content would allow flexibility and space for students to see themselves reflected in the curriculum. That space would give time and space to uncovering curriculum from multiple viewpoints. Understanding and building empathy for many points of view, so that one story doesn’t become the only story. What do you think is the purpose of education in this day and age? The world is changing at a blistering speed and the model of education we need to prepare students for that future can no longer rely on developing young people for a singular, defined career. We don’t know what the world will look like when these learner will reach adulthood, the purpose of education should be to do a better job of preparing for a changing world, rather than a defined one. How might we empower students to find their passion? What opportunities can we provide to students so that they are motivated to learn? Education should foster creative, problem seeking, collaborative, empathetic citizens that can adapt to our changing world. What would you like to see change the most about education? Let’s start with students. Like we said in the previous question, the change we would like to see for students is education that puts students in the drivers seat, with students empowered to find their passion. If we can empower students, they will feel their voice is heard and reflected in their learning. A single story is replaced with many stories and many voices and with that students we feel more ownership over their own learning. For educators, the change we would most like to see is a community of sharing, supportive educators, with silos created by walls, schools, departments all melted away. Education is stronger when it is done together. No one should ever feel that they are done learning or growing and everyone needs a coach or mentor. Our hope is that, moving forward, education becomes a much more collaborative act. On both of these fronts, we see signs of hope. Through maker education, equity work, design thinking and the thinking classroom model, we see a shift towards students uncovering the curriculum through play rather than being treated like empty vessels to be filled with content. On the educator front; organic professional learning networks, the twitterverse, and online sharing are creating cracks in those solitary silos of teaching. We’d love to normalize educators being in each other spaces, co-teaching and learning together. After all, how can we expect students to learn how to work together as adults, if they never see other adults collaborating and problem solving together. Sarah Cronin is a teacher for the Halton District School Board and the program leader for Special Education at Milton District High School. She is passionate about helping students with learning differences (LD) be confident and empowered and ready to make their mark on the world. You can learn more about her journey on her blog. My learning journey this year as an educator is centred around enabling and igniting teacher growth through teacher passion projects. I’m a big fan of the Hacking Learning Series - and my favourite book so far is Hacking Leadership by Joe Sanfelippo and Tony Sinanis. Chapter 8 highlights running Teacher Passion Projects as a way to develop capacity in staff and to help staff truly benefit from developing as a professional. Teacher passion projects are when teachers take control of their own professional learning through choosing an area of education to focus on. Topics are varied and learning is centred around working toward becoming a better teacher overall. Learn about it here! I was so enthralled by the idea that it inspired me to run a version of this in my own department. I intend to use blogging (~Shifters note: did we mention Sarah has a blog?) to track the journey. I work with amazing Special Education Resource Teachers (SERTS), and as a leader, I want to contribute to their professional growth in a meaningful way. Teacher Passion Projects give the teacher choice in what they want to learn - to connect that learning to their passions, with the goal of becoming a better teacher. I want to be a part of a team that consistently strives to be the best they can be. The concept is simple and can be easily executed. I contacted Joe Sanfelippo on Twitter (@Joe_Sanfelippo) and told him that after reading his book, I was inspired to recreate a version of teacher passion projects in my department. I asked for his help in setting this up. Joe connected me with his outline, and templates used in his school district. I took the templates and modified them to match my team needs. I presented the idea of participating in the passion project to my team. This was definitely an opt-in choice, it wasn’t mandatory, and it wouldn’t reflect negatively on them should they decide to not participate. My team this year has doubled in size. We were four SERTS (myself being the only full time SERT), and we are now eight. I am excited for the growth in department as we now have in addition to the original four - two Program Leads - one from Science, and one from Social Sciences/French, one teacher from English, one ELL teacher, and one additional EA. Wow! The intimidating part for me as a leader is: all of our new additions had little to no experience as a SERT. How was I going to support and help develop our new additions in all the knowledge a SERT needs to have? Answer: Teacher Passion Projects come to mind…. So out of the nine person team not including myself, five people have jumped on board this opportunity! And so it begins. We just started this journey after the October long weekend. I set a schedule to cover classes of participating teachers. This is a rolling commitment based on our schedule agreement. I book myself as busy in my calendar at these times. Regular meetings with each person to discuss, inspire, and guide the passion project. So … admittedly, I originally thought this would be more scheduled. However, it turns out I meet with them on a drop in basis. They drop into my office or I into theirs and we talk about how things are going, what resources are needed, the ins and outs of various topics. I’m learning a lot from each about their topics. The casualness of this discussion is what is great - we collaborate in our own professional learning community that has no start time or end time. I like this aspect as I believe it allows the learning journey to flow naturally. Passion Project topics included range from classroom pedagogy to leadership initiatives. Some teachers are learning about Distributed Learning and will use it to introduce blogging into their pedagogy with their classes. Another is experiential research that is aiming to document an example of the positive impacts of exercise and diet on emotional wellbeing with a student who struggles with mental wellness. Others are taking Special Education Additional Qualifications and are using this knowledge to enhance their teaching practice by understanding students with learning disabilities better and how to best support them and sharing this knowledge with their other departments. On the leadership end, we have website development designed for teachers full of helpful and thoughtful resources. Finally my own project … enhancing my leadership skills through supporting teachers in their learning - a.k.a. - capacity building. Connecting with each teacher at mid term in a more formal setting to discuss where they will take their project and their learning. Having the teacher record that on the Passion Project (Professional Growth Opportunity) Mid Year Review . It says Mid year because some passion projects may take the year, or it may take a semester. Either way, I will be meeting with them at mid term first semester. Through Discussion, tweak the purpose of the project and its connection to educational research. Through discussion, support the shaping of sharing the learning with others. Gord Donaldson is the current principal at Maple Grove PS who is also currently trying to innovate his golf game to lower his handicap in between trips to hockey arenas and baseball diamonds with his kids. I had a moment recently to reflect on our school’s journey in innovation. As I pondered how we got to where we are, I never realized how far we have come in such a short period of time. When you think innovation, you sometimes think big, or quick. Our journey was neither. What it is, is impactful. It all started with a cool spring day in May of 2017 at the Country Heritage Barn. Knowing we needed something to “Shift”, but not sure what it was, we sent about 20 staff members. Did that make it more difficult to have 20 occasional teachers in the building in one day? Sure. Was it worth it? Absolutely. Of course, we learned that we need to move from “ya, but” to “yes, and”, but more importantly we learned that a journey to innovation requires risks. It requires making mistakes and trying again. It requires getting out of your comfort zone. Heck, even those who “don’t dance” (like me!) tried line dancing. So, now what? It’s great that we can try new things but what does that mean? It was time for Maple Grove to go to the movies. In watching “Most Likely to Succeed”, staff were challenged to rethink school, to rethink what a 21st century learner is, and what it is they need to be successful. We started with flexible seating by incorporating a few bean bag chairs per classroom and a carpet area, even in intermediate. Imagine the stereotypes we broke! Now, only a year later we have bean bags, carpets, hokki stools, chair bands, standing desks, cushions, couches, tables at different heights and more in all of our classrooms. It’s funny how innovation can be contagious when it works in one classroom and everyone wants in! No classroom is left behind. We also added a stationary bike into every classroom for movement breaks. What did we find? In amongst dealing with the issues of pedals put on the wrong side in assembly or older students over-tightening the tension, we found that students were taking their movement breaks in the classroom instead of the hallways. And after the initial awe of a new tool in the classroom, we found that our students only needed 2-3 minutes on the bike before settling in. Need a break? Now it is happening in the classroom. No more pretending to go to the bathroom or get a drink, just because you need a movement break. Combine these fantastic tools with flexible seating, our halls became empty during class time as students have all the tools they need right there in the classroom. Talk about maximizing learning! Now that we had innovated our environments, it was time to innovate our pedagogy too. We had to teach students how to use the space. We had to teach students explicitly about self-regulation. By using the Zones of Regulation right across the school, our students began to recognize their learning needs and focus in on the learning. Our teachers realized that the academic learning needed to change too. We shifted from your typical classrooms to 21st century classrooms. We focused on Project based learning and guiding students through Inquiry questions. Are we there yet? Are we masters of Inquiry? Not in the slightest. Are we much better than we were twelve months ago? Absolutely. We started with tasks like “Create a community (either urban or rural) and research the different components about that type of community and present your findings in a form or your choice” and now we are asking our students things like “Will we run out of energy?” and “Why do people live where they live?”. Progress. Amazing progress in a short period of time. The first reports from students were that project based learning was way more engaging than school work. It was working! We felt like we had fooled kids into thinking that learning wasn’t hard. It was like magic. And as you know with 21st century kids, we had to keep the level of engagement high. That’s where we transformed the Library to our Learning Commons. 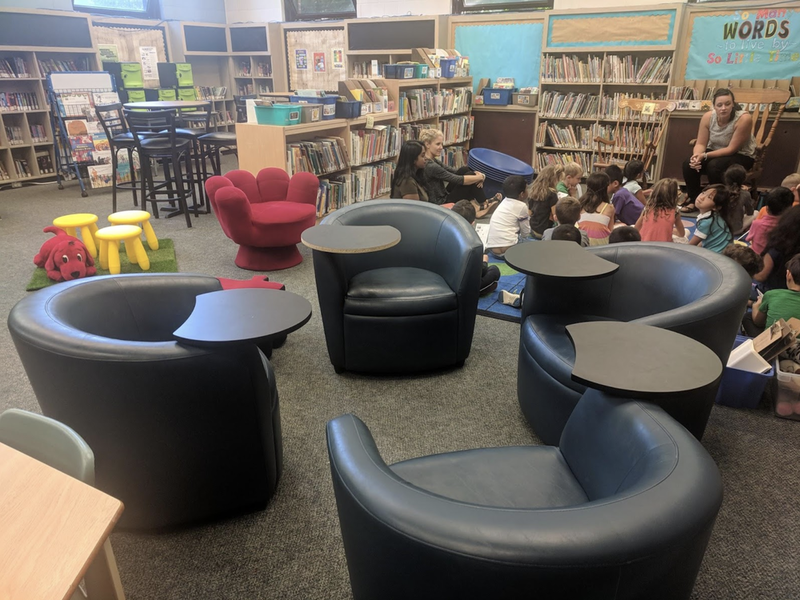 Not just with flexible seating, but with the tools that are available to students to help both engage and make connections. Chariot Races with robots down the hall to connect to medieval times? You got it! We are currently in the exploring stages with some of these materials, but engagement is high with our Dash and Dots, Spheros, Ozobots, Osmos, Vex Robotics, Greens Screens, Makey Makey and Bloxels. And that’s the next steps on our journey. How can we use these engaging tools to connect to student inquiry and learning within the curriculum? I set out to write a blog of about 250 words. I missed. There is just so much to say about our journey in such a short period of time. We could not be more proud of our progress, and the “Shift” that has happened in our school. Feel free to check out even more in a Maple Grove Innovation Slideshow. Words cannot describe it all, but a picture is worth 1000 words, I am told. Each step of the way seemed small. But when you look back, the Shift is monumental. We are not finished. We never will be. Innovation is a journey, and ours started small. When will you be ready to take risks, make mistakes, and step out of your comfort zone? Your students are counting on it.